Firstly, I will introduce myself. My name is Francesca Clarke, I am a Training and Change Co-ordinator for Netpremacy Ltd, a Premier Partner of Google. I started this role after leaving the corporate banking world where I witnessed first hand the blunders that are often made during a change in a business. In my previous role, I was heavily involved with training new starters and managing change projects. I found keeping the attitudes of others positive was an uphill struggle as systems were constantly changing with inadequate change management. This encouraged my passion for helping companies and individuals to understand the importance of managing change. During my time at Netpremacy Ltd I have led numerous change initiatives and been part of too many to list all by name. Last year I had the pleasure of working with a particular customer whose goal was to implement Google Drive across the organisation within the space of two weeks. This was a challenging piece as time was of the essence, but by not sacrificing communication we had an undeniable success. We had great support from the customer as they understood the importance of communication in overcoming negative attitudes towards change. With great executive sponsorship and a willingness to be open, honest and empathetic to different skill levels the project was a triumph. Change management can and should be acknowledged and implemented through all aspects of life. 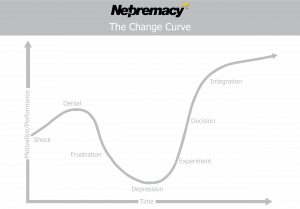 ‘The change curve’ is a useful tool in understanding the human reaction to change of any kind; showing the different stages that people go through when faced with a change in any aspect of their life, it can also be used to understand why we act the way we do in both personal and business change scenarios. The important thing to remember is that this is not a linear process. Whilst going through the curve, setbacks can happen and you may find that individuals or even entire companies can move back and forth through the different stages. The following scenario is one that can easily be avoided when a company ‘Goes Google’: John works in a finance department that has always used Microsoft Excel, they have just been told that from now on they are to use Google Sheets. John has never used Google Sheets before and has not received comprehensive training or floor walking to help him through this change. John still has to meet his deadlines and has been left to struggle to meet these deadlines whilst using an unfamiliar product. John will probably have very strong negative feelings towards the new tools as a result of a lack of change management, therefore heavily impacting his productivity. If John had been kept informed through communications, training sessions and post training support, this could have been avoided. Taking these small steps could help someone feel confident and comfortable with change and eventually lead to this new product being integral into how the company works to achieve the goals of the project. Working in change management, it is my role to orchestrate a plan that will guide people through these stages, prevent these setbacks and most importantly provide the correct guidance and support. Keeping the change curve at the front of our mind, communication should be a present and persistent concern throughout every stage of a project or change. However, if you are thinking about executing a project without proper communication… This is a dangerous game to play. Communications are the lifeline of any project, they have the power to maintain the levels of positivity needed, stop incorrect information making the rounds and encourage individuals to be proactive in their own learning. It has been well documented that 70% of change initiatives fail. To measure how successful a change initiative is we examine the goals of the project and see if the change has achieved these goals. These goals should be explained and emphasised through communications to raise awareness of the desire for this change and how to achieve them to ensure success. Ensure to choose the correct Executive Sponsor to deliver these communications. For example, if you are running an IT project the communications should not be coming from someone in IT, instead they should be coming from a well known face of the company. C-level management work best to stop the all involved from believing ‘it’s just another IT project… nothing to do with me’. (To find out more on the importance of Executive Sponsorship click here). Another big faux pas is underestimating who needs to know about a change in the business or organisation, a change in the company. Everyone needs to know about any change – even if it will have a seemingly insignificant effect on their role, as even the smallest effect on someone can lead to negativity and this may have a domino effect throughout the company, leading to a failed change initiative. We are fortunate that in this day and age we have more available channels of communications than any generation that has come before. We should not limit our information distribution to merely emails and monthly newsletters, as you will find most people within a company can ignore these or at most skim read them not absorbing the important information often contained within them. Today businesses have multiple internal communication channels at their disposal…emails, texts, letters, leaflets, posters, table stands, banners, internal communication platforms, public websites, videos and animations are just a few of the methods for little cost or none at all. So long as what you’re putting forward is eye catching and transparent in it’s content you can use any and every channel available. As part of Netpremacy our change team have delivered weekly broadcasts direct to users to brush up on useful hints, we have created corporate and fun animated videos to spread the goals of projects, used products at the customers disposal to create an open forum for sharing useful information, celebrating success and congratulating colleagues on achievements… but we can’t give away all our secrets! As a customer facing trainer I have seen first hand the issues that arise from a lack of communication, for this reason when we take on a project the Change Management team and I will always ask which communication channels the company uses. If I am given more than two channels to use from the customer I am about ready to jump for joy, and let’s not even get onto how happy I become when I am told by a customer…“We have a great in house communications team.” This is the dream of anyone who specialises in change management, as from the start the customer already understands the importance of change management in any project and communications in general. The need for a customer-driven focus on communication is essential in tackling opposition to change in the workplace. You will find that the strongest resistance can come from the most unsuspecting places, for the smallest of reasons. So facing this early in a change project is an absolute must! Try to put yourself in the users shoes and explain in simple language. Never assume that anyone has any previous experience with what will be introducing. If you use jargon you run the risk of excluding people and this will cause a lot of issues that communications are designed to prevent. The idea is to remove boundaries and hierarchies and instead give those who would usually shy away from change a reason to embrace it and become an evangelist. If you have any questions on the topic of this blog post or a general question contact us.